This is a tool for remeshing, as I first wrote about and demonstrated here. However, since those first videos over a year ago, this has been improved upon and developed a lot. One of the most significant changes under the hood is that it now uses the custom half-edge mesh class Plankton developed as an open-source collaboration by myself and Will Pearson (to whom I owe great thanks for all his fantastic work on this). Big thanks also to Giulio Piacentino for sharing his great work on Turtle, and to Dave Stasiuk, Mathias Gmachl, Harri Lewis, Jonathan Rabagliati and Richard Maddock for helpful mesh discussions. High quality triangular meshes have many applications, including physical simulation and analysis. These features can now even be moved while the remeshing is running, and the mesh will stay attached. When a mesh contains features with tighter curvature, smaller edge lengths are needed to faithfully represent the geometry. However, applying these reduced mesh lengths across the whole surface, even in flat areas where they are not needed can be impractical, and slow everything down. A solution is to refine the mesh according to local curvature. 'Fertility' model from AIM shape repository, remeshed with curvature adaptivity. Here the edge flipping option is also set to valence based, which causes the mesh to become anisotropic in the direction of curvature. Relaxation based purely on 1d elements will not give accurate minimal surfaces, we need to use proper 2d elements. However, when relaxing meshes to produce minimal surfaces, generating a high quality initial mesh can be problematic and tedious. 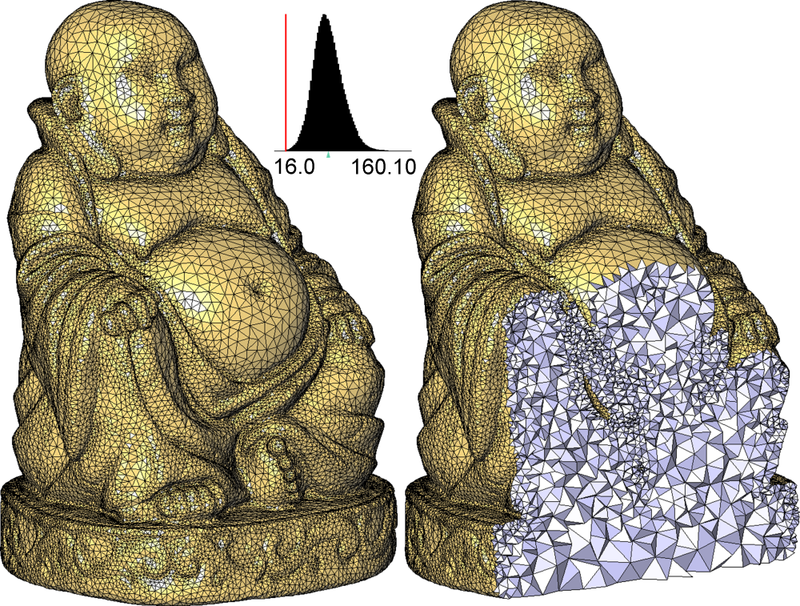 Uneven meshing can cause the relaxation to fail or give incorrect results, especially when the relaxed geometry changes significantly from the input, causing the triangle quality to degrade even further. By continuously updating the connectivity of the mesh to maintain even sized and nearly equilateral triangles, even very large changes to the boundaries become possible, and the surface still minimizes mean curvature. This allows exploration of sculptural forms in a more dynamic and flexible way than I think has ever been possible before (seriously - try it out, I think you'll enjoy it). Surfaces may 'pop' if the boundaries are moved suddenly or too far apart - as sometimes no minimal surface solution exists with the given boundary conditions. Here is the component and a basic example file. Feel free to ask any questions about its use, report bugs, or request changes or additions. This is still a work in progress. To install, unzip and place the dll and 2 gha files in your Grasshopper libraries folder (replacing any previous versions of these you may have installed - these are more recent than other releases). Make sure they are all unblocked, and restart Rhino. Downloading the above files I'm getting this error coming up? Could not load file or assembly 'PlanktonGh, Version=0.3.0.0, Culture=neutral, PublicKeyToken=null' or one of its dependencies. The system cannot find the file specified. Could not load file or assembly 'Plankton, Version=0.3.0.0, Culture=neutral, PublicKeyToken=null' or one of its dependencies. The system cannot find the file specified. However when downloading the new Plankton files no errors appear apart from in the script Mesh Machine can't find Plankton Version 3.03? - Any advice how to solve this? I have been trying to use meshmachine to get the resulting mesh to adapt to the color from my rhino analysis mesh. I used the mesh deconstruct component to extract the color of each vertex and converted the color to hsl. The hue was input into the SizV and the mesh vertices into SizP. I also have also tried setting the adapt to 0 as suggested in a previous post. It is working to a certain degree but I was wondering what is the best way to use color or brightness to get an adaptive mesh using meshmachine. I know Daniel mentioned he was experimenting with using images but I couldn't find an example file showing such a workflow. Any help would be appreciated. Would it be possible to use Roberts 3D Delaunay as a dynamic mesh which's density can be controlled? You cant see the subfolder on my dropbox? thanks for the quick reply. Your def requires "StarMath.dll" and "MIConvexHullPlugin.dll", which it seems I'm not able to find as public download. I dont know if it is of any use - but a while ago I used the MiConvexHull to generate 3D delaunay meshes = tetrahedrons. thanks for the quick reply. I searched the forum for what you mentioned at the end, but couldnt find the conversation you refered to. Could you drop the link? Basically... I would like to create a structure as effiecient as 2D Delaunay, so basically a 3D Delaunay. I tried with Proximity (not good as it fails to make connections) and Voronoi 3D (posted below). I am planning to create a structure like this with almost 50.000 edges and trying to find a better way to do it. I found a good reference for what I'm trying to achieve, I guess. Volumetric remeshing like you are talking about would involve a volumetric mesh data structure, containing definition of tetrahedra and the connections between them. The Plankton half-edge structure used in the script above for the triangle connectivity is for surfaces only.